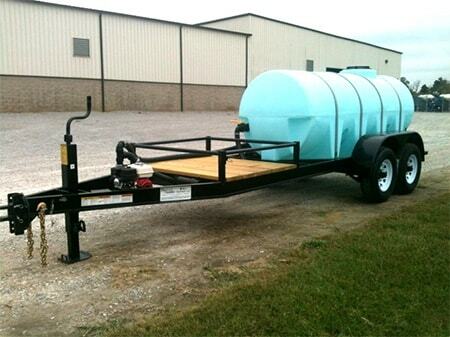 We offer a complete line of Nurse Trailers. Some of our common sizes are 1010, 1025, 1610, and 1635 gallons. All of our Nurse Trailers come with a UV stabilized plastic tank, heavy duty painted steel channel frame, Honda poly or cast iron pump, and 2″ plumbing. Tanks are offered in white, black, or blue. We can also customize our nurse trailers with different pumps, shuttle platforms, lights, fenders, and plumbing. Please contact our sales staff for questions or pricing.